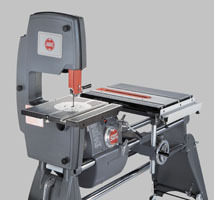 Although many woodworking operations may be possible with hand tools or portable electrics, they�re usually faster, easier and far more precise when you can use stationary, Special Purpose Tools, designed specifically for the job. However, the term Special Purpose Tools, more often than not, is somewhat of a misnomer, since many of these tools are quite versatile and capable of performing a number of different, important functions. Here are their primary purposes. We'll tell you more about their additional applications later. 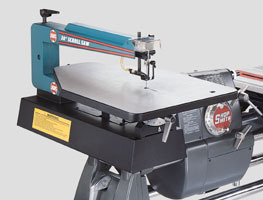 The Jointer -- is a "must-have" tool if you're planning to build cabinets or furniture. Its purpose is to plane the edges of boards so smoothly that you can join them together into wide panels without unsightly glue lines. 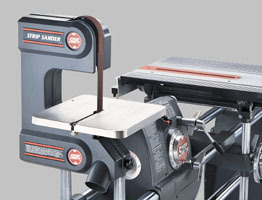 The Bandsaw -- will cut tight or sweeping curves with matchless speed and precision. 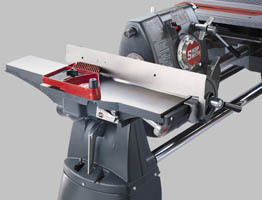 And, since it offers a more generous depth-of-cut than a table saw or circular saw, it's also often the best choice for cutting stock up to 6" thick. The Scroll Saw -- will amaze you with its extremely intricate, internal or external cuts (straight or curved) in stock up to 2" thick. This is a prime evolutionary example of what we used to call "jigsaws" - just far, far superior! 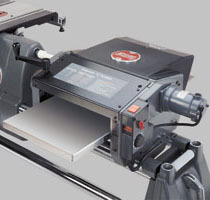 The Thickness Planer -- will significantly improve the fit of your project components (and therefore, the quality of your projects)...by seeing to it that every piece of stock you use is of a consistent thickness. 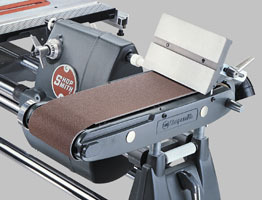 The Belt Sander -- is an amazing work-saver that will provide precisely-adjustable back-up support while it quickly sands down or smooths stock up to 6" wide. It makes easy work of woodworking's most tedious task. The Strip Sander -- is an often overlooked machine that's great for all types of intricate sanding and grinding tasks...as well as sharpening.